Beyoncé on Wednesday also dropped a surprise album titled "Homecoming," recorded from her performance at Coachella last year. In a heartfelt post paying homage to Michelle Obama who has been named to Time's "100 Most Influential People," singer Beyoncé called the former first lady "brilliant" and "regal." "Loving Michelle Obama wasn’t much of a choice," Beyoncé wrote in the piece published Wednesday as part of the magazine's annual list. "It was something that came naturally, because of how she carried herself. Because she resembled us and was moving in spaces where, as black Americans, we weren’t exactly meant to be, she seemed so powerful." Beyoncé on Wednesday also dropped a surprise album titled "Homecoming," recorded from her performance at Coachella last year, to coincide with the release of her Netflix documentary. She has long been friends with the Obamas and performed at President Barack Obama's Inaugural Ball in 2009 and his inauguration in 2013. The Grammy Award-winning singer described Michelle Obama as "strong and ambitious" and praised her for using her platform to help others. "She empowers all of us to interrogate our fears and surpass greatness," Beyoncé wrote. 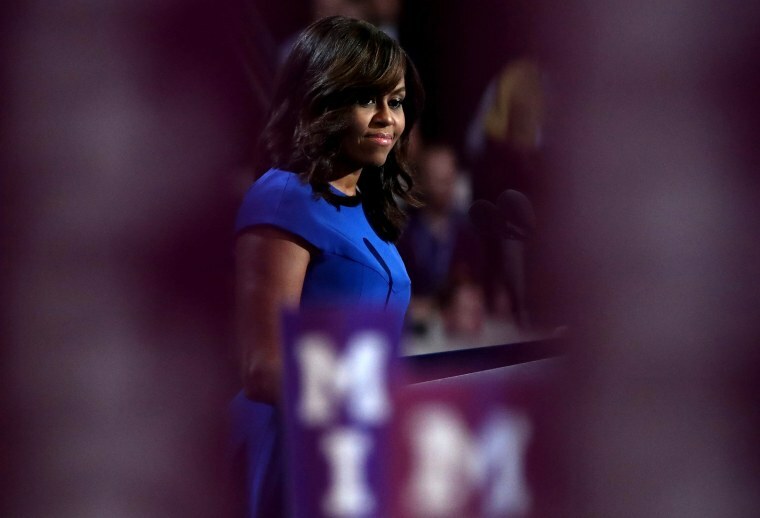 "I am so grateful that my daughters and my son live in a world where Michelle Obama shines as a beacon of hope who inspires all of us to do better and to be better." Joining Michelle Obama on the list is NBA star LeBron James, President Donald Trump, singers Lady Gaga and Ariana Grande, Pope Francis, special counsel Robert Mueller and Christine Blasey Ford, who publicly accused then-Supreme Court nominee Brett Kavanaugh of sexual assault. Kavanaugh, who has denied the allegations and went on to become a Supreme Court justice, also made the list. "Christine Blasey Ford’s ambition wasn’t to become a household name or make it onto this list. She had a good life and a successful career — and risked everything to send a warning in a moment of grave consequence," presidential candidate Sen. Kamala Harris, D-Calif., wrote about Ford. Former New Jersey Gov. Chris Christie also penned a short post praising Trump for his "pushing China and our North American neighbors for fairer trade agreements and withdrawing from the Iran nuclear agreement." Singer Troye Sivan called Grande the "biggest artist in the world," while singer Celine Dion honored Lady Gaga for her support of the LGBTQ community and efforts to end bullying. To view the full list of honorees, click here.